Excellent expose and a determined will to do something about these robbers you have brightened up my day Mr Cherbi! Well done Peter and the Sunday Mail - I always buy the paper now you'll be pleased to hear !! 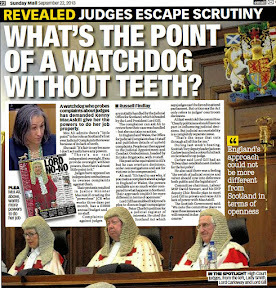 As I said before this looks as bad for the Scottish Legal Aid Board as it does for the 14 lawyers and the Crown Office. 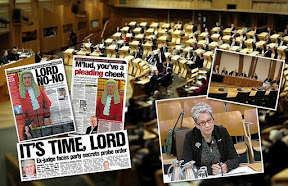 I presume these investigations conducted by SLAB have been costly and obviously at taxpayers expense so why oh why does it take Scotland's brave critic of the legal profession to break the story instead of a statement from SLAB's Chief Executive along with a complaint the Crown Office are twiddling their thumbs again? 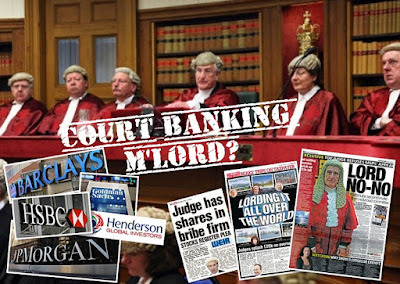 Of course the answer to my question may well be they were banking on you exposing it which you have done but what happens next?Can the Crown Office decisions to spare their colleagues in the legal profession be looked into by anyone?I doubt it simply because if they were looked into by any reasonably honest investigation the same can of worms currently doing the rounds at the Met and News International would be exposed in Scotland perhaps even more so. Keep up the good fight Mr Lone Ranger. 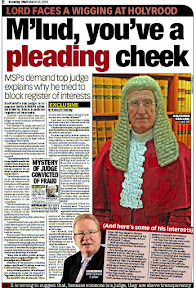 So much for Bullshitter MacAskill trying to save legal aid by cutting back on the stipcourts.They are all stealing it before his very eyes! oh and I dont think the Crown Office's failure to prosecute 14 lawyers (even the dead one) in 5 years is in any way accidental..
Good point about it happening under Elish Angiolini. I wonder if things will change under Frank Mulholland? WHEN DO WE GET TO FIND OUT THE NAMES OF THESE CROOKS? 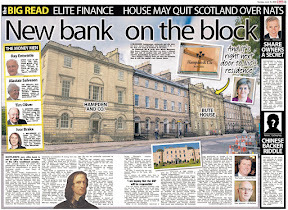 Well dear Kenny MacAskill if you continue to wave £160 million at lawyers of course they are going to line their pockets safe in the knowledge the Crown Office & cops wont touch them with a barge pole! Christ Peter you should be writing in a newspaper yourself your blog is bloody amazing! That was a very frank admission you got from the Crown Office dont you think? I wonder if there is a hidden message there maybe something like they are not too happy about the situation and wanted to say something about it but couldnt? Some of those wasters who protest against companies not paying their taxes should get off their a*ses and protest outside all these bloody lawyers offices who are fiddling legal aid after all its taxpayers money too! "• One solicitor was placed on indictment for Sheriff and Jury proceedings for fraud. That solicitor entered a preliminary plea in bar of trial on the grounds of insanity which was sustained by the Court. 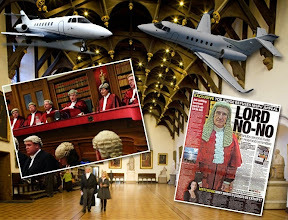 In light of that decision, the case was deserted pro loco et tempore;"
Haha what a flaming joke he was declared nuts after being accused of defrauding public funds and Elish Angiolini's Crown Office just accepted it? I think we need to know a lot more about this! I'd say the problem here is the Crown Office and SLAB having to go through them so if you give SLAB the power to prosecute on its own this might help considerably. Also I think you should be working at SLAB since you seem to have more determination to do something about this than any of them! 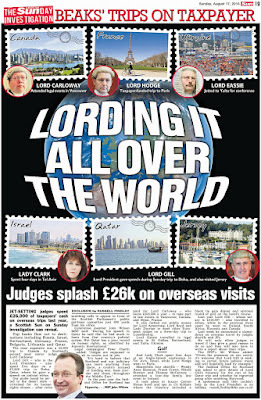 Crown Office are full of crap if this had been MPs expenses we were told the lot and their names so why no names of these THIEVING LAWYERS???? One or two cases not getting through could be viewed as normal but all 14 of them? Definitely a whiff of the legal profession closing ranks on this one. Now we know why people who protect their colleagues get a gong! CORRUPTION GOES RIGHT TO THE TOP! No comment from Jane Irvine and the SLCC ? Perhaps they dont know what the words "prosecution" or "fraud" means if its related to their friends the lawyers ! Just to let you know your friend Mr Pattison who answered your FOIs (probably more than he should by the sounds of them) was promoted to being a Sheriff today! The Queen has appointed Gregor Murray and Scott Pattison as all-Scotland floating sheriffs, to be based in Grampian, Highland & Islands at base courts to be arranged. Mr Murray was admitted as a solicitor in 1988 and for 13 years was a court partner in Carltons (later Blackadders). Since 2003 he has been partner and head of civil litigation at RSB Macdonald, handling mainly commercial and insolvency based litigation. 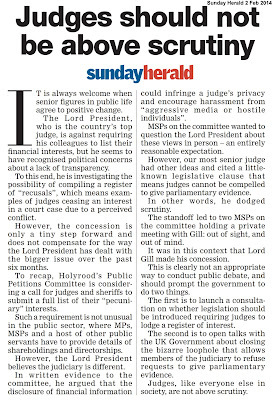 He is a member of the Sheriff Court Rules Council and lectures in civil procedure at the University of Dundee. Admitted as a solicitor in 1994, Mr Pattison's career to date has been with the Crown Office and the Procurator Fiscal Service. He served as a procurator fiscal depute in Lanark and Hamilton, prior to undertaking a lead role on human rights law and devolution issues under the Scotland Act 1998. He was appointed a divisional procurator fiscal in 2002, head of policy at Crown Office in 2005, and district procurator fiscal for Paisley between 2006 and 2008. Since 2008 he has been Director of Operations at the Crown office in Edinburgh. The appointments, based on recommendations by the Judicial Appointments Board for Scotland, will take effect on dates to be confirmed. Just as well its in the SM. 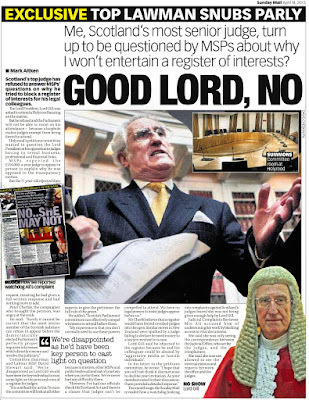 The paper I used to write for banned stories on anything to do with rogue lawyers but that's fine because their circulation hit the toilet when I left and no one reads it now except pedos in the legal profession and the occasional judge who likes the occasional rent boy! 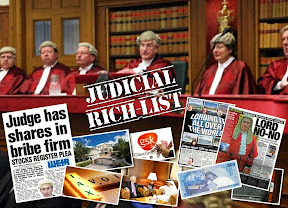 £160 million being thrown at lawyers so there is bound to be a lot of fraud especially after reading on this blog how crooked the Scottish legal profession is.Who would trust any of them now? 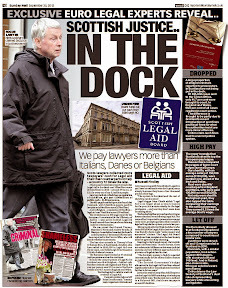 Its difficult enough even trying to get legal aid so any lawyer who gets it fraudulently should be jailed. LOL They made the guy who broke the fraud info a Sheriff!!!!!!!!!!!! If he ever gets a lawyer who stole legal aid in front of him I hope he sends him down forever!!!!!!!!! Agreed there needs to be investigations into the Crown Office and SLAB over their failings and as another person suggested questions asked why SLAB stayed silent about this until YOU started your enquiries. Great work Peter I wouldn't trust anyone else except you to write about this kind of thing! 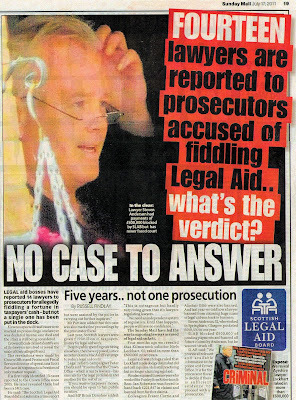 I wonder how many members of the public have been prosecuted for legal aid fraud during the smae period? 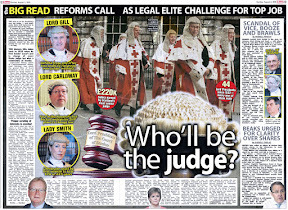 Advocates on the legal aid take as well? What a non surprise there! I can think of at least one I know who does it! And the weirdest thing of all about this is not one mention on television that lawyers are getting away with criminality are escaping prosecution and taking huge chunks of the legal aid and not giving justice to their clients. Who is shutting down any publicity about this or public debate? No doubt about it kid you've got guts going up against these lawyers and their scams! Nice little club these lawyers have going on where you get to steal from taxpayers and get away with it no matter what.How do we sign up? Good to see someone trying to do something about lawyers stealing our money! 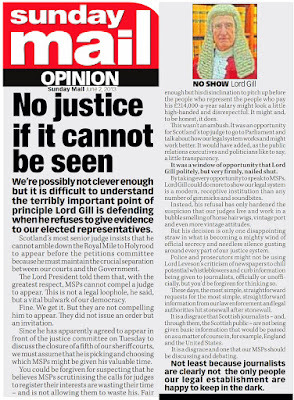 Many thanks for your comments and expose on the absolute failures of the Legal Procession in Scotland, not a typing error as that all it is in Scotland, a parade of Queens from Parliament House to St. Giles with wigs that would make Elton John proud. 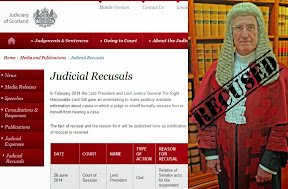 I won't use any superfluous titles such as the legal procession love so much, especially Boyd and Angiolini, and the rest of the inbred clique, tellingly Mulholland will not be any better given his pedigree as the SG under ex HMA. 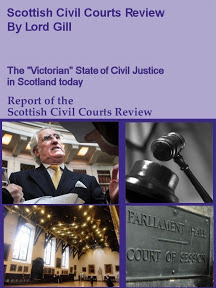 The Flaw society of Scotland and the Faculty of Inadequates do not represent the legal needs of the PUBLIC, however these monopolistic institutions cite tradition and history as the main reason for their existence, given that at the time of the creation of the futility of the inadequates, most punishments would have been death by hanging, or even HDQ and judges imposing such sentences would have been members of that same cult. The blood running down the royal mile must have been bloody, how little changes, the only change is that whereas previously "off with their heads" would have been the sentence past, nowadays it is more likely to be lets "play with their heads", the difference being that nowadays it is a slow, long and tortuous process and procedure overseen by geriatric flaw lords, ex members from both Flaw S of S, and Futility of Inadequates (FOI). 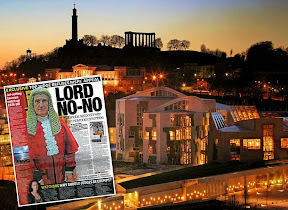 It should ultimately be the paymaster that calls the tune, however in SLAB it is not, it is the crooked, bent and incompetent 2 bodies that are given grace and favour in Scots Law by a Scottish Government too interested in their similar own self preservation and the clique of cohorts. 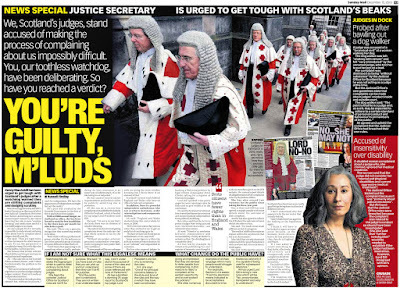 This is more tellingly obvious given the Dame's recent demotion as not being appointed a lady, more a ladyette from Govan, how the WC (working class) forget their humble origens and a just legal system, as can be seen from the "QC" grace and favour titles given to ex HMA & HMA (neither earned under an OxBridge devil master). Why do we all sit back and take it? 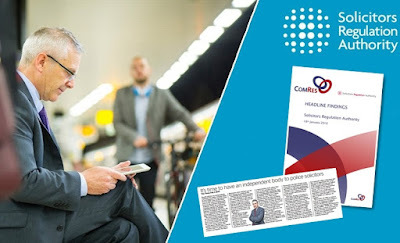 I can not believe that in 2011 we are still talking about a complete lack of openess, transparency, accountability, liability, responsibility, inter alia, from the Police, The COPFS, Crown Office, the LP/LPG and his cohorts, SLAB, SCCRC, the Flaw Soc of Shotland, the Futility of Inadequates, the SLCC and all other quasi-legal institutions. Institutions is the most appropriate phrase given that all are working against the greater and wider PUBLIC interest and cling on to some historical aspect or precedence in common law, or indeed even canon or roman law, how perverse given that Scotland claims not to have been invaded by the romans and that sectarianism (and other bigoted prejudices) are still prevalent in 2011 and the so called "Public Authorities" and Ombudsman allow this to fester, and Double, double toil and trouble; Fire burn, and caldron bubble in a Scottish Legal System. As an atheist, I allow all the freedom of choice of religion. As a pacifist, I object to all wars and violence. As a humanist, I believe in human rights uber alles. As an amnesty international supporter I believe in freedom for all. 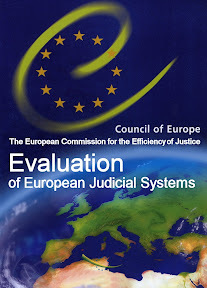 As a victim of aggravated prejudice by the state and their cohorts, justice is what? As a person from Scotland, I have none of the above and so many questions remaining to be answered since 2002. Orwell's 1984 is truely present in Scotland in 2011 in terms of government thought control,also with Animal Farm depicting the present legal bodies of Scotland,"ALL ANIMALS ARE EQUAL, BUT SOME ARE MORE EQUAL THAN OTHERS".How relevant the inspirations of Orwell are to date and at School they seemed to be a world apart from the world I lived in, how wrong was I, shamefully wrong and blatantly naive. 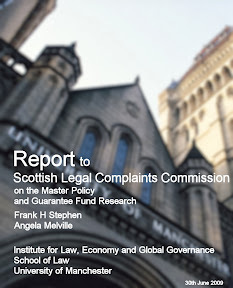 Most tellingly the Police Ignorant of Government Statue (PIGS)are so reluctant to pursue claims of criminality by solicitors, preferring to refer the matters to the "self regulation" of the Flaw Soc of Scotland as they themselves prefer to be regulated by their own internal and secretive self regulatory "complaints and discipline" departments, as do any Public Authority, most tellingly the Scottish and UK Governments. 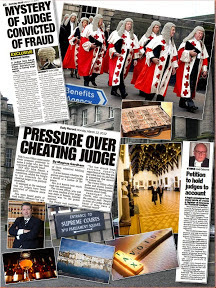 Apologies to all if this seems like a rant, but its intention is to highlight the systemic abuses from the ground to ground zero in Scotland's antiquated judicial and legal system. Peter, I have to congratulate you and all your followers on the creation of this website, which although fills me with despair and frustration, however I would suggest a Knighthood, however Sir Peter I am also a republican and merely a serf outside of the wheels of patronage, in that alone maybe I have been saved. 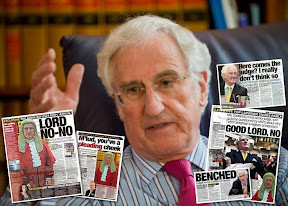 Sir Peter (from a commoner), take care and watch out for the MI5 brigade and sedition charges that may be raised against you and the rest of us. Long live the internet GOD (Guard On Duty), saving freedom of speech and true justice uber alles, Hitler and Himmler would be very proud of the Scottish legal state institutions in operation to date. Kind regards and keep up the excellent work. As my first posting I have remained anon, but I know that this is being recorded by the 1984 crew. If the blog system works, the previous 3 blog postings are to be read as one, I hope that this helps all. I shall now watch the "Life of Mohammed" for inspiration and knowledge, despite that I am an atheist. No comment from the Scottish Government? 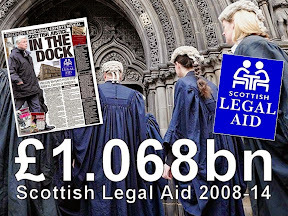 If they dont want to do something about legal aid fraud then maybe George Osborne should withhold the 160 million until they force themselves to do something about it.After all didnt your justice minister Macaskill recently threaten to do the same about the Supreme Court funding? "The allegations relating to eleven of these solicitors were marked for no action on the basis of an insufficiency of evidence. This related to seven separate reports (for which Crown Counsel’s Instructions were obtained in three)"
SLAB either got their facts wrong or the Crown Office bent over backwards not to prosecute these lawyers either way its a scandal and most certainly worthy of an independent investigation. According to their own figures there are 14 lawyers on the take.What do you think Peter?More to come? 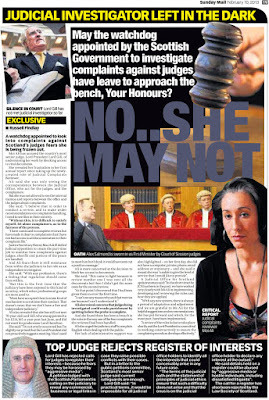 For heaven's sake people its not in the public interest for most of the Scottish newspapers to print this kind of stuff about the legal profession at least this is what I was told at my former paper by a pos who works for the Law Society. This same pos from the Law society told my editor to call me in and give me a rollicking for a story I wrote about a slimebag lawyer stealing from an MS victim which never made it to print. I ended up leaving the weel kent Edinburgh rag after the bosses made my f'ing life a misery because they were asked to. Good to see the Sunday Mail/Daily Record and Peter have some guts to stand up to these cretins.Stick with them lads. 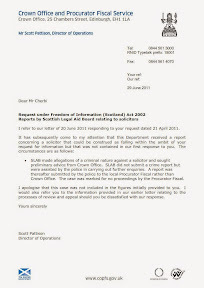 14 or 15 lawyers if you add the other foi reply I think! I've been looking through what lawyers are getting for legal aid and there are some firms on 1/2million.15 lawyers on that kind of money is going to be a lot probably closer to 10million and this is just the ones they are willing to tell us about although no names of course so Cherbi is onto something very big here and we should all be doing something more about it than just commenting here.How about we give him a hand by writing to our politicians as bent as they may be they have to listen to us and the ones who dont we can always send our lack of replies here to be published.Lets get rid of this legal aid racket and the bastards who are allowed to steal it and any other crooks who get in the way of something being done. About as accidental as Sean Hoare's death before the Murdochs & Brooks testify today at Parliament! Someone suggested SLAB be given powers to prosecute lawyers.Well it would be a good idea if they had these powers but would they use them? 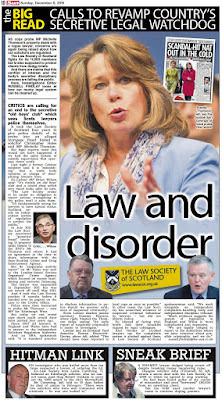 Peter already wrote about the Lockhart case where the Law Society and others were calling the shots against SLAB so dont expect too much to change if they ever get their own prosecution powers! £160 million and no one at the Crown Officer is even bothered about it being stolen? re the last comment should we even bother writing to msps? 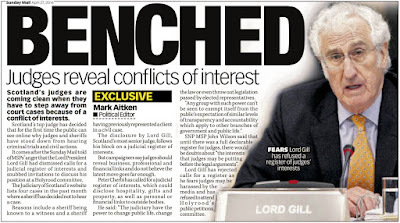 Last week you wrote about Mark Strachan being chased for alleged £60,000 worth of legal aid fiddles.Any update on this story? I wonder if the Crown Office will close down that one too? A sensible idea.I think I may write to Mr Osborne myself suggesting this as a way forward to save money destined for the wallets of shark lawyers which could be put to better use! 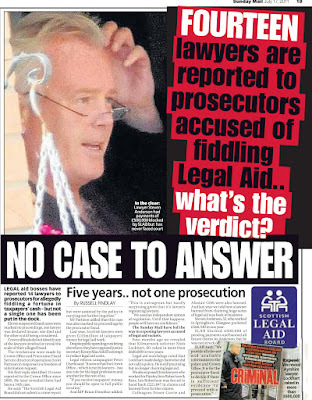 Someone I know who should know all about it reckons about 40% of solicitors who do legal aid work commit a certain amount of fraud so this is a big thing really and good to see you and the newspaper are tackling it. Keep us posted on your trip to the Scottish Parliament which I fully support,even if I chose to remain anonymous! The letting off of the 14 crooks may have happened under Angiolini but you should also remember Frank Mulholland and the rest of the gang now at the top were part of the same team all along so no one escapes blame here. No one with any sense is going to believe for one second these 14 lawyers escaped prosecution because there was not enough evidence. The Crown Office explanation stinks as does the lack of any public statement from SLAB who appear to have scurried away under a tree while all this has been going on. 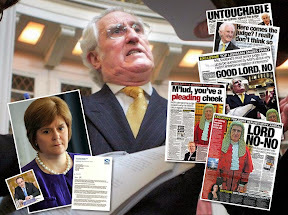 Had it not been for you and the Sunday Mail no one would have known about this.Now its time for a major investigation into it all and you must be part of it Peter now you have uncovered this corrupt habit of allowing lawyers to escape jail for their crimes. The solicitor who died - was that a suicide? I seem to remember some lawyer dropped dead who stole 1.8 million and SLAB said it was a one off which is now proved BS after your own investigation about it. 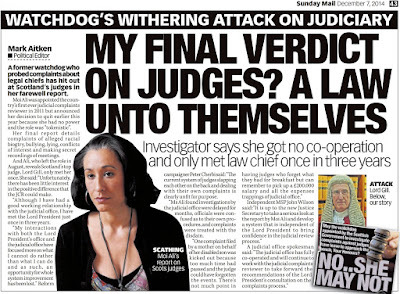 The widow of a solicitor involved in Scotland's biggest legal aid fraud has agreed to pay back the cash. James Muir, who was based in Bothwell Lanarkshire, received £1.8m in legal aid payments over seven years. A repayment agreement was reached with his family and a law firm he had briefly worked for. The solicitor took his own life in 2005. 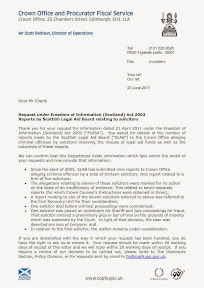 Details of the repayment were included in the annual report of the Scottish Legal Aid Board. The solicitor had specialised in child welfare matters and died in April 2005. After his death, the board announced that it was working with the police and Crown Office to investigate "possible abuse" of legal aid by the solicitor. The 45-year-old was understood to have been involved in about 36 cases a year involving children's legal aid. The board found that he "embellished" child abuse cases in order to claim additional money. The annual report said: "During 2004-05, following the successful enhancement of our reporting and analysis capability, board investigators revealed that a solicitor had fabricated documents to fraudulently obtain £1.8m over a seven-year period. "We urgently undertook a review to ensure that the case was an isolated one and fortified our controls to minimise the risk of a recurrence. "We reported the matter to the police, but no action could be taken following the death of the solicitor." 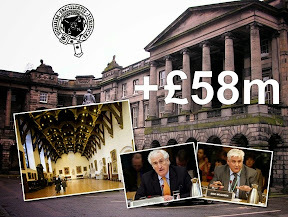 The report said the legal aid board had worked with the Scottish Government's civil recovery unit to recover the loss. "A binding agreement has been signed by all parties that will effect recovery with no loss to public funds," it said. 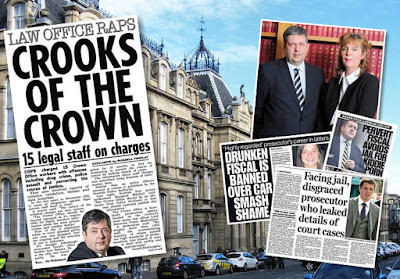 Oh well there can be no doubt now the Scottish legal profession is rotten to the core and all it took to find it out was poor Peter;s family getting ruined by Drew Penman and his buddy Norman Howitt. Judges explain the reasonable doubt standard to jurors in a number of ways. Federal jury instructions provide that proof beyond a reasonable doubt is "proof of such a convincing character that a reasonable person would not hesitate to act upon it in the most important of his own affairs." That's why they don't get prosecuted, not some conspiracy. You can't reveal names because you'd get sued for something like defamation of character. Then where would the taxpayers' money go? Also the solicitor who committed suicide left a lot of broken lives behind him. Have a little compassion before putting "dropped dead". Nice to see your readers are still of the same quality Peter. 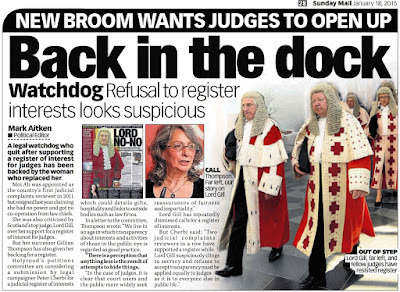 Its understandable much of Scotland's tame media stay away from this (no guts) but you would think the legal profession's own press may make mention of the fact 14 of their number managed to dodge arrest and trial. Just goes to prove further bad news involving lawyers is buried quickly. Several comments naming solicitors who are the subject of complaints relating to legal aid fraud have not been published as I would rather report on them at a future date and with more media attention. 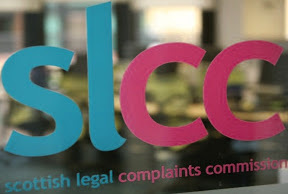 I can assure anyone in the above circumstances it is in your interests to make the media aware of your concerns before going to the Scottish Legal Aid Board, SLCC, or Law Society of Scotland. Several comments insulting other comments, one it seems in praise of a solicitor stealing £1.8 million pounds of legal aid, who then went onto commit suicide and was the subject of arranged stories in certain newspapers, have not been published. So what kind of person would support a thief who stole 1,8million from taxpayers? or someone hacked off because you exposed this scum racket dipping their fingers in the till again? Bad start to the day or a guilty conscience?How much legal aid are you on? 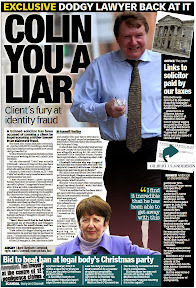 Should we feel anything for Mr Muir who stole millions from Legal Aid while many deserving cases are refused it?I think not.I am happy to feel nothing for a thief who stole from the public purse.If he had stolen it in China or the Middle East he would not have time to commit suicide before they caught up with him. Broken lives.The legal profession leaves more broken lives in its wake than any other on earth including the army. Clearly the quality of Peter's readers is not in doubt given your own input albeit one sided and seemingly in praise of a fraudster colleague? I further suggest you take up your arguments on burden of proof with the Scottish Legal Aid Board who,at considerable public expense I assume clearly felt there was sufficient proof to prosecute. For the Crown Office to refuse.Well now we are talking about the same Crown Office who desert trials when they feel like it or engage in malicious prosecutions for the hell of it.I could go onto mention McKie,Lockerbie,Sheridan,Wold's End and the rest..
Firstly, nowhere in my statement did I say good job for stealing 1.8m. Nor did I suggest that there are not broken lives all around the world because of legal action. Mr. Cherbi himself can attest to that. All I’m saying is that you should leave off Mr. Muir’s family and the people his death affected, that’s just heartless. I hope something like that never happens to anyone. I also did not say that there are not other injustices happening, you mention the notable ones. I merely put forward a reasonable explanation for why these specific 14 cases were not taken forward. I thought this was a forum, not a back slapping exercise. When other people are saying some of the profession are “queens” and “inbred” this was massively insulting. This was my reason for commenting on the readers. I’d be ashamed of such a homophobic statement. I’m a simple member of the public with a little education and an ability to try to see the bigger picture rather than accept things at face value. End of. 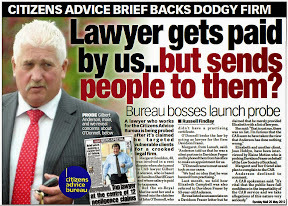 Oh dear it looks like we have a lawyer breezing in to support legal aid crooks! Utter rubbish.You are back-pedalling faster than Rebekah Brooks. "All I’m saying is that you should leave off Mr. Muir’s family and the people his death affected, that’s just heartless. I hope something like that never happens to anyone." The only one mention of Mr Muir's family is coming from you.No one else did other than the story copied in from the hootsmon.If you have probs with what they said take it up with them. What is all this nonsense about homophobic statements?There are none on this blog that I can see and I subscribe to the comments as well as the postings! Are you one of those people trying to post weird comments on Cherbi's blog for malicious purposes?I've heard about those you know.We who read Mr Cherbi's exposes of Scotland's criminal elite in the legal profession are of more quality and more clued up than you think. "I’m a simple member of the public with a little education"
Rubbish.Your preoccupation with burden of proof in your earlier comment gave the game away.Dont come the innocent now.I noticed you did not substantiate any of what you said,particularly with regard to my response and the enormous amount of money SLAB must have burned up getting to a reasonable burden of proof on their own. I wonder about the homophobic reference.Are you trying to suggest a link of homophobia to legal aid fraud?If so can you expand on it?I'd like to know more as I just downloaded the lists of lawyers and advocates who are claiming legal aid and I would like to tie up this homophobic claim of yours to legal aid/SLAB. Looking forward to hearing your next explanation and make it a credible one this time please.If you are treating this as a forum which I do,remember to reply to everything I've asked you and dont leave bits out! Come on he stole the money everyone agrees he did and it is supposedly being paid back although no proof offered it actually is being paid back just a lot of talk.Death does not absolve the crime and like the other person said no one mentioned his family except you.Take your beef and homophobes stuff elsewhere. Hmm actually this reminds me of a tv interview I saw somewhere recently and the qc got all shirty with another lawyer about a new law being homophobic instead of sectarian which is what everyone else was told it was..so is it now homophobic to say lawyers steal from legal aid?Pfft! 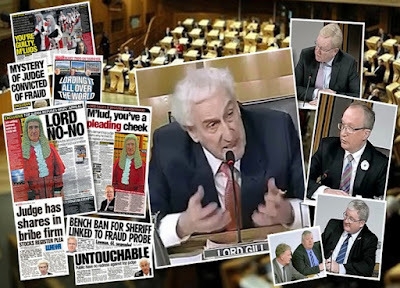 Be in no doubt I am watching this discussion relating to the theft of £1.8 million pounds of legal aid by James Muir (deceased) and note all that has been said so far. Whatever the truth is in this particular case, I am sure it has not surfaced in any newspaper yet. For one thing a media colleague of mine was deliberately shut out of press releases on this case long before it appeared in a significantly sanitised form in some newspapers. I will endeavour to report the full facts whether I get them from official sources or not. 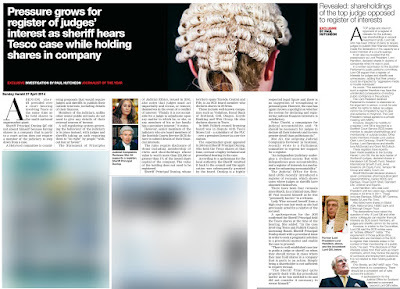 Going back to the topic of this posting, the fact that 14 solicitors escaped prosecution for alleged legal aid fraud, clearly the law is not working or being applied to actions committed by the legal profession, as opposed to crimes committed by members of the public. 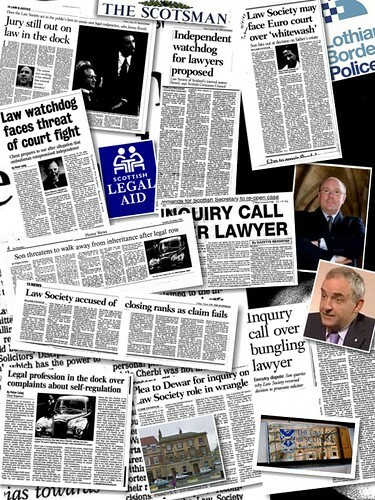 I have already been shown papers documenting significant involvement from the Law Society, Legal Defence Union and other 'representatives' of the legal profession in legal aid fraud case, enough to say without any doubt deals have been done to avoid headlines of solicitors being prosecuted in Scotland for legal aid fraud. A LEGAL Aid boss has been arrested in a public toilet with a rent boy. Douglas Haggarty, 57, was arrested in a shopping mall after being found with the teenage prostitute. He is the head of legal services at the Scottish Legal Aid Board (SLAB) - where his duties include lecturing lawyers on their public conduct. Haggarty was arrested in British Home Stores in the St Enoch Centre, Glasgow. Both men were arrested and Haggarty was charged with soliciting in a public place. The procurator fiscal started summary proceedings against Haggarty. 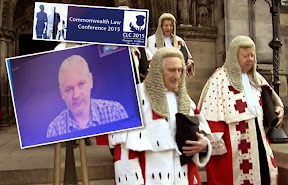 But his lawyer Paul McBride QC - who sits as a member on the Scottish Legal Aid Board - asked the Crown Office to drop the charges, claiming there was not enough evidence to convict. The procurator fiscal has decided to scrap court proceedings and deal with the case by a direct measure. These are powers available to prosecutors to deal with cases quickly. They include issuing a fine, compensation order and written warning about future conduct. The powers available to procurators fiscal were extended last year. The rent boy also had court proceedings against him dropped and was issued with a direct measure. Haggarty, who lives in the Merchant City area of Glasgow, started work as a solicitor in 1975. 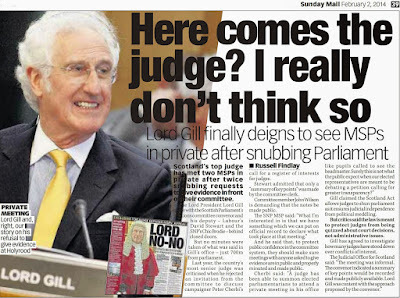 He helped Lord Bonomy compile his 2002 report on improving the practices and procedure of the High Court. 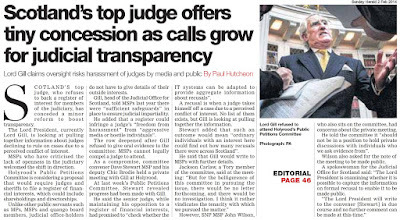 Haggarty submitted a paper to a Scottish Parliament finance committee on criminal procedure in 2003 and has been a member of other High Court review teams. The legal aid chief, who declined to comment, has been off work sick since the incident in January. 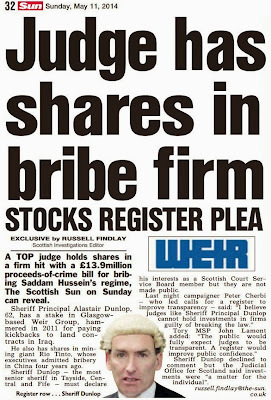 A slab spokesman said: "The Board is aware of the case and that it has not been prosecuted. It's not appropriate for us to comment further." Haggarty isn't the first SLAB boss to be arrested and dogged by controversy. Dr Richard Scott, former head of SLAB, was twice arrested over incidents with his wife. Arrest In January 1997 he was charged with three assaults but only convicted of breach of the peace and disorderly behaviour. Six months later Scott was arrested again when police were called to his home but the Crown Office decided not to bring criminal charges. Scott stood down as head of SLAB in 1999. A LEGAL Aid boss, who was arrested in a toilet with a rent boy, has kept his job and won't be struck off as a lawyer. Douglas Haggarty, 58, was found with the teenager by security guards in British Home Stores in the St Enoch Centre, Glasgow, in January. 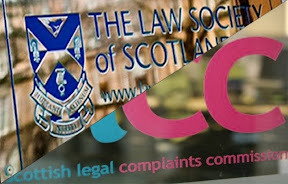 The head of legal services at the Scottish Legal Aid Board, where his duties include lecturing lawyers on their conduct, was charged with soliciting in a public place. 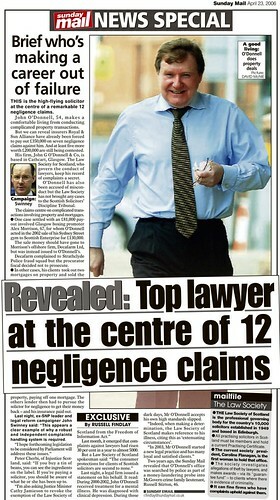 But his lawyer, Paul McBride, QC, claimed there was not enough evidence and charges were dropped. The Crown Office said Haggarty had been dealt with by a direct measure but would not say whether it was a warning letter, fine or other penalty. 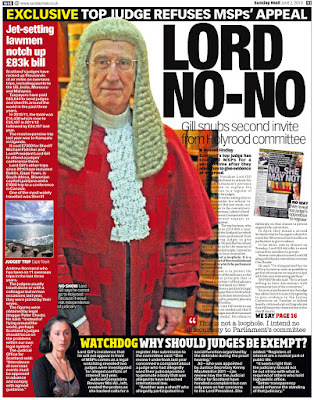 Now the Law Society of Scotland have revealed he will face no professional sanctions. The high-flying lawyer, who lives in Glasgow's Merchant City, went off sick from work after the incident but is understood to have been back for several months. A Law Society spokesman said: "The society's client care committee took account of the fiscal's decision and reasons for it." 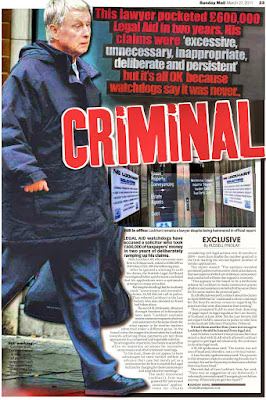 A slab spokesman said: "It would be inappropriate for the board to comment on a matter personal to a member of staff." Charges against the teenager were also dropped. 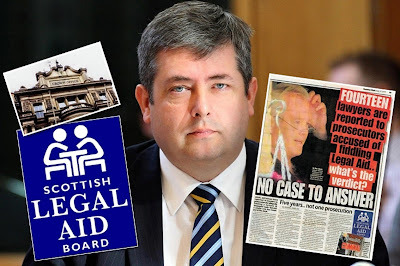 Thanks for the added interest in the James Muir legal aid fraud.Now I've read what Peter has to say about it I will do some enquiries of my own as it seems there is more to the story than SLAB and the Law Society wanted made public. This one started with 14 lawyers let off the hook for legal aid fraud and ends up with comments about a legal aid boss off the hook for an incident with a rent boy in a public place. Is this not proof enough we should have a new structure in place to police and award legal aid to people who really deserve it instead of lawyers who are pocketing millions for themselves usually by fraudulent means? 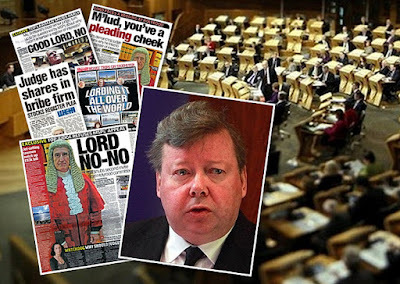 SLAB and the Crown Office are unfit for purpose and this Muir fraud should be thoroughly investigated & exposed. 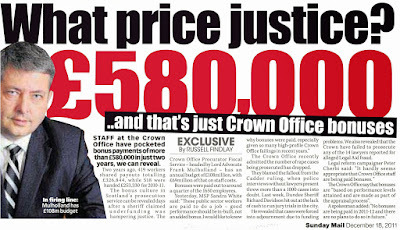 If this is not corruption I dont know what is.The entire Crown Office should be sacked - they all favour the crooked lawyers even when stealing taxpayers money.Take notice everyone this is YOUR money going into these crooks pockets and the prosecutors are allowing them to get away with it.In fact some of them probably went out to dinner with the criminals after taking the decision not to prosecute! 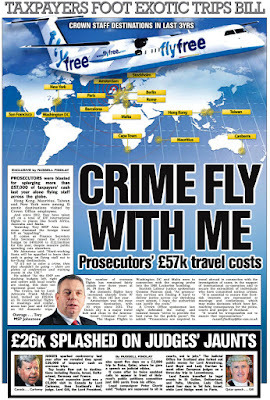 Really amazing your prosecutors in Scotland get away with something like this and the rest of the press dont even bother with it.Just amazing.If this happened in England it would have been on television and running for days in the papers. Kind of late to the party here anyway just wanna say someone probably took a BRIBE to allow 14 lawyers to steal public money and get away with it!